Meet Bo: The New First Puppy! The First Puppy has been revealed. According to the Washington Post, the Obamas' long-awaited dog is a 6-month-old Portuguese water dog named Bo. He'll be officially presented on Tuesday. Bo is a gift from Senator Edward M. Kennedy, a Portuguese water dog owner himself, who acquired the dog after another home didn't work out. "We couldn't be happier to see the joy that Bo is bringing to Malia and Sasha. We love our Portuguese Water Dogs and know that the girls — and their parents — will love theirs too," he told the Post in the statement. The dog already met the Obamas in a top-secret session at the White House weeks ago, which surprised the girls. 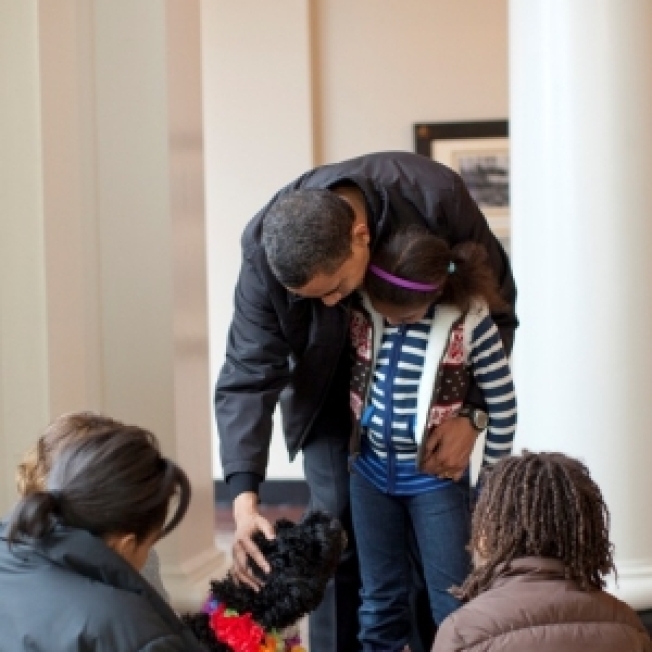 Bo was reportedly well-behaved, but Malia is already planning on his future doggie education. "Malia has done extensive research," a source told the paper. Details of Bo's residency, including where he'll sleep and his feeding and walking schedules, are still in progress. "They're approaching this responsibility as a family," the source said. Sensing a possible spike in popularity for Porties, a White House staffer told the paper that the energetic breed isn't for everyone. "They play, play, play. Then they sleep," the staffer said. The Obamas had intended on finding a shelter dog, but Portuguese water dogs rarely end up there, so the First Family will reportedly make a donation to the Washington, D.C. Humane Society. The Washington Post was given an exclusive on the dog news, though some details of Bo's arrival – he was incorrectly cited as "Charlie" – and a photo of a black-and-white dog in a lei very similar to an official White House shot leaked onto the Internet on Saturday. President Obama famously promised his daughters a dog in his acceptance speech last November after winning the Presidential election.